Wish you were getting ready to set sail on a luxury cruise? This week Kelly has another wonderful Disney Cruise mini-kit. Cruise Sail Away Party is perfect for documenting the excitement of leaving the dock for the open seas. 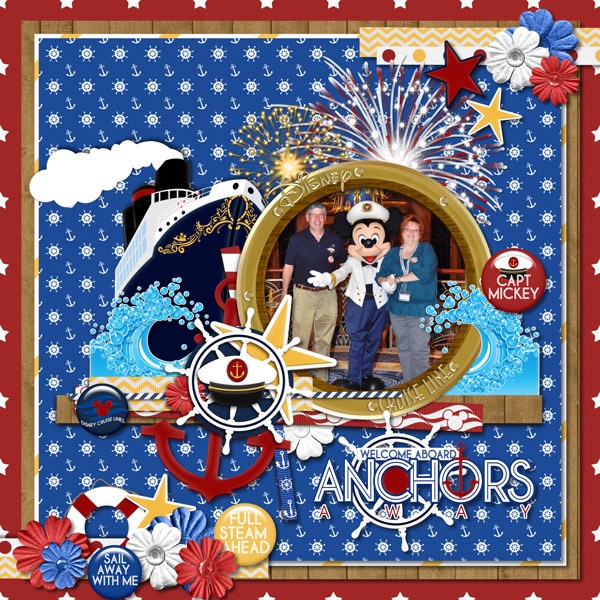 This versatile kit can also be used for nautical or patriotic theme pages. Be sure to check out the coordinating Pagestarters, Word Art, Tags and Flairs. The kit includes a blue and white alpha and papers in blue, red, white, and wood. Unique elements include fireworks, portholes, captain's wheel and hat, cruise logos, lifesaver, ship, wave, banners, and much more. Now how about some cute freebies to coordinate with this fun mini? You can find them at Jenn's blog, Lisa's blog, and Roxana's blog. Have a great weekend and happy scrapping!